In Street Mobster, known in Japan under the title of Gendai Yakuza: Hitokiri yota, the primary focus is on the gangster Isamu Okita (Bunta Sugawara), who has a reputation for being a violent person with a great disdain for authority. After he is released from serving a five year prison term, Okita expects his life to be as it once was, but soon discovers that the crime scene in Japan’s underworld has changed. Determined to gain supremacy, Okita forms a new gang with former associate Kizaki (Asao Koike), taking on a pair of Yakuza families, lead by Takigawa (Keijiro Morozumi) and Shunsuke Yato (Noboru Ando), in several bloody encounters. Outside of its primary focus on violence, Street Mobster is a somewhat difficult film to follow. The skirmishes between the Yakuza groups is entertaining with director Kinji Fukasaku bringing a raw intensity to the action, but it is practically non-stop, making it a chore to fully understand what’s going on and why. It’s also the sixth film in Toei’s Gendai Yakuza series, all of which were made by different directors, and also paving the way for the even stronger Battles Without Honor and Humanity series shortly thereafter. 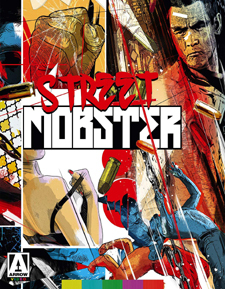 Arrow Video has given Street Mobster a nice Blu-ray release with a presentation that “has been transferred in high definition by Toei Company and the film is presented in its original aspect ratio of 2.35:1.” That being said, it’s a mediocre transfer. Scenes are often too dark, making them difficult to view. Daytime scenes fare much better, however browns tend to dominate the color palette. There’s also an abundance of apparent film grain, and the overall appearance of the transfer is soft. For the audio, a Japanese 2.0 mono LPCM track is available with English subtitles. It’s serviceable with clear dialogue and no distortions or dropouts. There’s also an audio commentary by Japanese cinema expert Tom Mes, who shares his thoughts and opinions about the film, a theatrical trailer, a still gallery, and an insert booklet with an essay on the film by Jasper Sharp.